Hello Bloggy Buddies and Welcome to Friday Night Five! There are days when I feel tired, down and discouraged. There are days when I feel hopeless and weak. There are days when I just plain feel worthless. But there are NEVER days when I can't look around at my surroundings and find things to be thankful for. Friday nights are when I like to share a few of my favorite 'Thankfuls' for the week. 1) - First, I must say that I absolutely LOVE Friday nights. I get to come home, put my jammies on, enjoy some well deserved computer time, and just relax. I probably add this one EVERY Friday night, but it is such a treat after LONG work weeks!!! 5) - And tonight as I sit at my home office desk, I am grateful to be able to look out my west facing window and view an absolutely beautiful sunset in Phoenix, AZ. Tonight, look around you! What do you see? I'm sure, like myself there are things you wish were different about your life, but what can you be grateful for tonight? What can you thank God for? What small miracle is happening in your world tonight? Can you share it with us? Can you share it with a friend? Can you reach beyond your pain tonight and find some wonderful glimpse of Hope for tomorrow? Praising God and Considering Being Thankful with Great JOY!!!! This is the first time I visited you site and I LOVE it. I to get to feeling depressed. I suffer from some medical problems and can't leave the house and I admit I start feeling sorry for myself a lot. You know I use to go to this meeting once a month the was about finding God. I tried so hard. I wanted what those women had. I don't know what I do wrong but I just can't get it. Any suggestions would be great appreciated. I want to be happy, content, and be able to enjoy life as the those reborn women didn who had accepted God into thier heart!! I am inspired by your thankfulness and need to find my own reasons to be thankful. Have a blessed weekend! 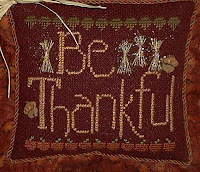 I love remembering to be thankful! Even thought I can't 'see' you in person...I sure am THANKFUL for YOU! You are such a bright light in this world...the Jesus shining through you girl is beautiful...hugs and love to you and prayers up to Him!